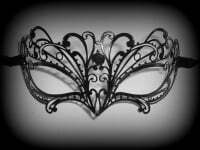 Buy this stunning Black Filigree Metal Venetian Masquerade Mask With Genuine Swarovski Crystals For Women & be the belle of the ball. 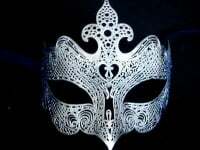 An extravagantly designed, innovative and handcrafted Venetian mask for women who demand style. 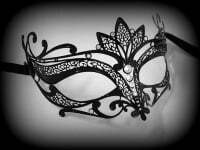 With traditional satin ties, the mask is perfect for your next Masquerade wedding, party or any Venetian masked ball event.